This report includes estimation of market sizes for value (USD million) and volume (tons). Both top-down and bottom-up approaches have been used to estimate and validate the size of the market and various other dependent submarkets in the overall market. 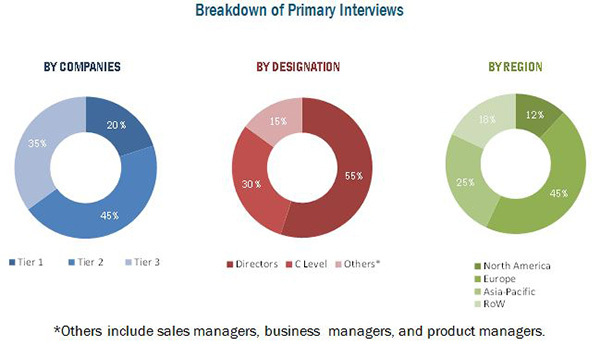 Key players in the market have been identified through secondary research, and their market share in their respective regions has been determined through primary and secondary research. All percentage shares, splits, and breakdowns have been determined using secondary sources and were verified through primary sources. Farmers/crop manufacturers and companies are the end users of agricultural chelates. The use of agricultural chelates depends on the crop type, requirement of chelates, as well as the government policies regarding the promotion of their usage. Prominent companies such as BASF SE (Germany) and Akzo Nobel N.V. (The Netherlands) have diversified product portfolio and strong distribution network across the globe, with offices at strategic locations. On the other hand, small- & medium-sized enterprises have limited product ranges and limited financial strength; therefore, these enterprises enter into strategic partnerships and agreements with key market players in order to increase their market share. Such factors enable the small- & medium-scale enterprises to better their distribution channels and gain access to new technologies and operational know-how of other companies. BASF SE (Germany), Haifa Chemicals (Israel), Syngenta AG (Switzerland), AkzoNobel N.V. (The Netherlands), and Nufarm Ltd. (Australia) collectively accounted for the largest portion of the market. Deretil Agronutritional (Spain), Shandong IRO Chelating Chemicals Co. Ltd. (China), Protex International (France), Valagro SPA (Italy), and Van Iperen International (Italy) also have a strong presence in this market. This research report categorizes the agricultural chelates market based on type, application, crop type, and region. The global agricultural chelates market has grown exponentially in the last few years. The market size is projected to reach USD 566.1 Million by 2020, at a CAGR of around 6.7% from 2015 to 2020. Emerging countries such as India and China are the primary targets of the industry. Increasing demand for food, soil degradation, and need for micronutrients are some of the major driving factors for this market. The market based on type is segmented into EDTA, EDDHA, DTPA, IDHA, and others. 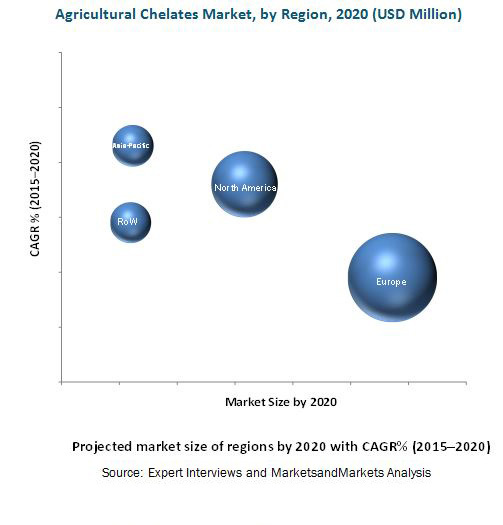 EDTA chelates accounted for the largest market share and it is projected to grow at the highest CAGR during the forecast period due to demand for agricultural crops that has led to the need for higher yield. EDTA helps in the removal of poisonous metals, such as lead, mercury, and cadmium. The market, based on application, is segmented into soil, seed dressing, foliar sprays, hydroponics, and others. Soil accounted for the largest share of the agricultural chelates market in 2014. Soil nutrition is an imperative part during the cultivation of crops, and agricultural chelates are an essential addition into the soil to increase crop productivity. The soil segment is projected to grow at the highest CAGR from 2015 to 2020. Agricultural chelates such as iron, zinc, and manganese, when applied to the soil that is deficient of micronutrients, improves the bioavailability of these nutrients and improves crop growth. In the crop type segment, the market is segmented on the basis of fruits & vegetables, oilseeds & pulses, cereals & grains, and others. The cereals & grains segment accounted for the largest share in 2014. The rise in the global population has resulted in the growth in demand for cereals & grains, especially for wheat, which is projected to have a considerable amount of consumption in the developed region. Many cereal growers have adopted the use of liquid fertilizer technology to gain high crop yield. For instance, Australia makes use of fluid planting technology to gain crop yield. Asia-Pacific is projected to grow at the highest CAGR during the forecast period. Soil degradation, demand for micronutrients, and modern agricultural practices are some of the factors driving this market. Bioaccumulation of nonbiodegradable agricultural chelates is a restraint faced by the market players. Nonbiodegradable chelates such as EDTA have poor biodegradability which causes soil erosion and can harm plant growth as well as result in environmental pollution. The agricultural chelates market is characterized by moderate competition due to the presence of a number of large- and small-scale firms. Collaborations, acquisitions, agreements, and expansions are the key strategies adopted by these players to ensure their growth in the market. The market is dominated by players such as BASF SE (Germany), Haifa Chemicals Ltd (Israel), Syngenta AG (Switzerland), Akzo Nobel N.V. (The Netherlands), and Nufarm Limited (Australia). Other major players in the market are Deretil Agronutritional (Spain), Shandong IRO Chelating Chemicals Co. Ltd. (China), Protex International (France), Valagro SPA (Italy), and Van Iperen International (Italy). 13.10 Shandong Iro Chelating Chemicals Co. Ltd.